Personalized jewelry has never been easier! 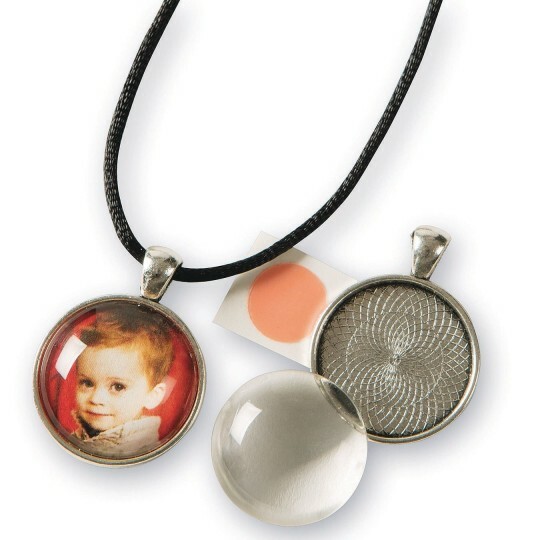 Making personalized jewelry and accessories has never been easier with our picture frame pendant pack. Choose your image, then glue the picture to the flat side of the domed glass cover using any clear drying glue. Once glue has dried, trim the edges, and affix glass to the metal base using the included sticky dots. You can also turn small works into keepsake jewelry. Add a split ring (not included) to make a key ring. Pack contains 12 round bases (25mm each), clear glass covers, adhesive dots, and how-to sheet.